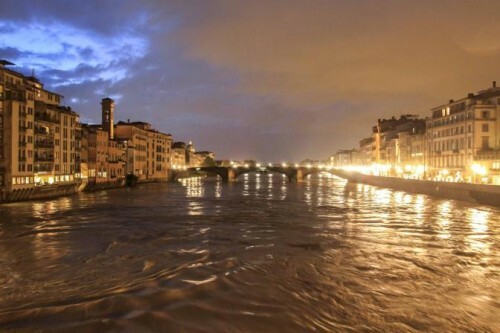 Florentines always think that the river to watch after days of rain is the Arno. 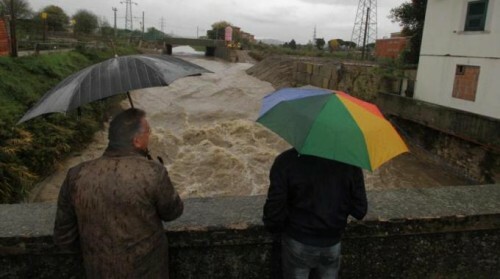 But this week with incredible downpours – known as bombe d’acqua (bombs of water) – a small creek, the Mugnone, threatened to overflow its banks in parts of the city. 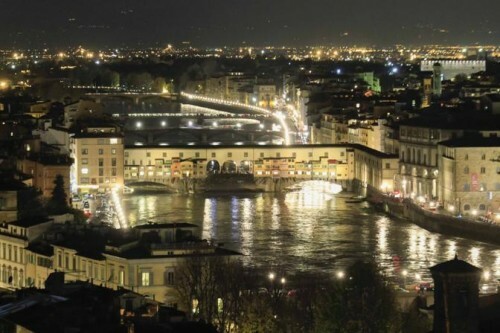 The Arno also continues to rise. The Mugnone is a tributary to the Arno. Residents located along the Mugnone were told to head to higher floors and parking garages warned car owners to move their vehicles to higher ground. 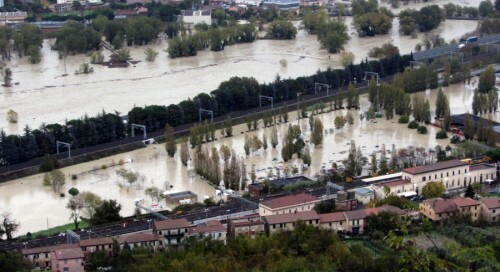 Results of the rising Mugnone tributary and the flooded sewer system in Florence. 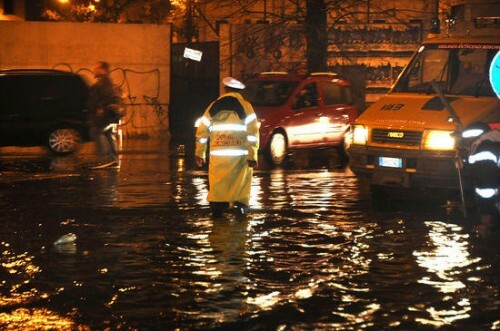 In Tuscany Massa Carrara, on the coast, took the brunt of the flooding with cars being swept off the streets and roads being destroyed. Tromba d'aria off the Tuscan coast - a rare sight. 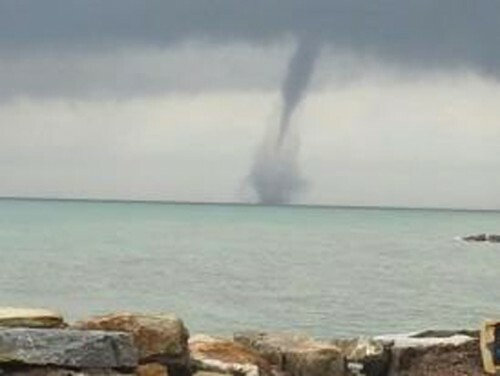 The southern coast of Tuscany had a different kind of excitement when a rare tromba d’aria (trumpet of air), or water spout, touched down in the sea near Rosignano. St. Mark's Square is awash with debris. Venice is still under more and more meters of acqua alta (high water), which the Venetians are used to, but getting very tired of this winter. Fewer gag shots by tourists are turning up on the blogs. 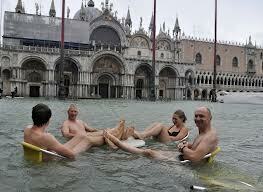 Hard to serve lunch in Venice these days. But hope is in sight. It’s drier today in Tuscany and the forecast for the next week is, if not sunny, at least without the bombe d’aqua. 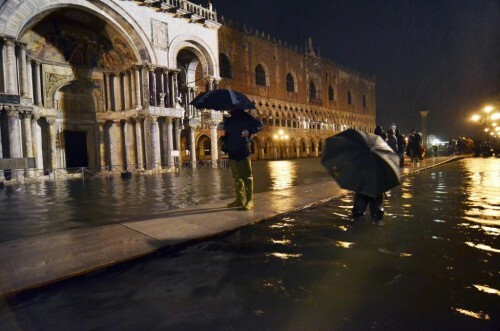 Even the walkways are washing away in Venice. And my friend Giorgio (see post from two weeks ago) is heading for London, where they are used to rain. My cats, of course, will miss him. But perhaps the Italians would like him to visit again only during a summer drought. 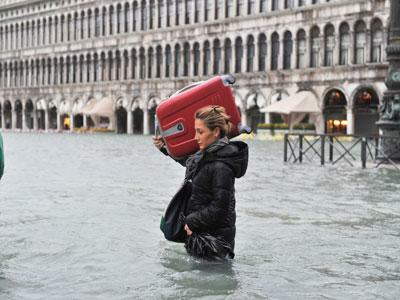 They say a combination of heavy rain, strong winds and warmer than usual temperatures have put Italy under water this week. But I know the truth. My friend – let’s call him Giorgio – arrived in Florence this week after causing that wet thing called Sandy a couple of weeks ago in his hometown of Washington, DC and his other place out in Virginia. 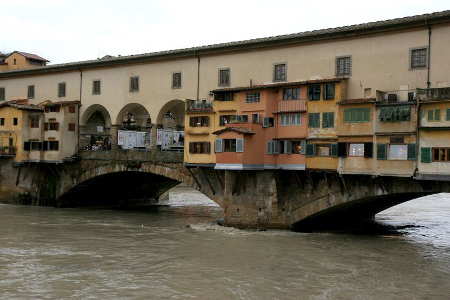 Remember how low the Arno was in August? 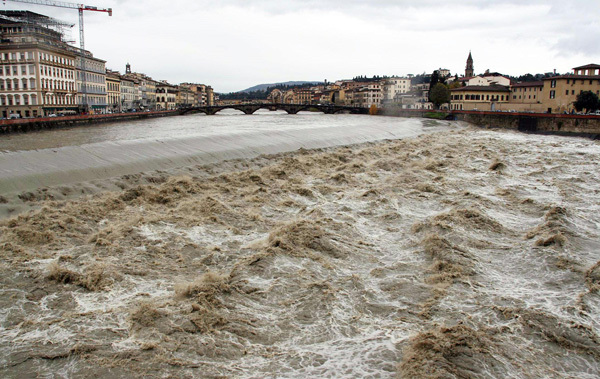 Now the Arno is getting to the highest level since the flood of 1966 (nobody knows where Giorgio was that November). Be warned! Giorgio plans to stay in Florence until December. He’s also scheduling a side trip to Rome for the Vermeers (luckily the Scuderie del Quirinale are on a hill). Now when were we going to dredge the Arno channel? Giorgio has lived many places. 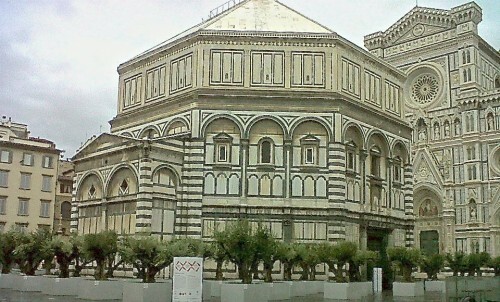 One of which was Florence, a decade ago, where his apartment was below the water table, cut into a hill in the Oltrarno. To add to the problem, his upstairs neighbor’s 100-year-old pipes broke and leaked through the bedroom ceiling. 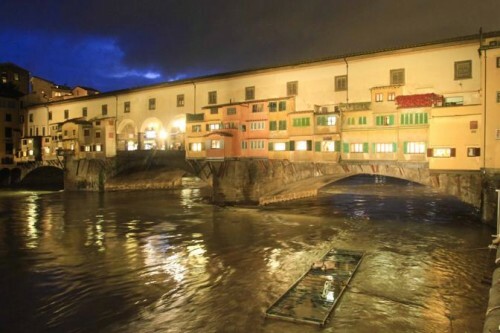 Time to get the gold and silver out of the Ponte Vecchio shops? When he left Florence for London, he kindly gave me his sisal area rug. Two months later, the workers repairing my roof failed to cover it properly on a weekend when it rained continuously. The livingroom ceiling (200-years-old, made of terracotta bricks, plaster and insulated with straw – thus, yellow- and siena-colored water poured through) caved in, ruining Grigorio’s carpet. A vacation of a lifetime. I have posited the theory that in a past life Grigorio got on the wrong side of Neptune and he has been paying for it since. Just two days before the recent rains brought the high water in Florence, the residential water was turned off (ostensibly for for street repairs) in a two block radius around the apartment building he is staying in near the Duomo Now the Arno, which still has a riverbed as shallow as it was in 1966, is rising. 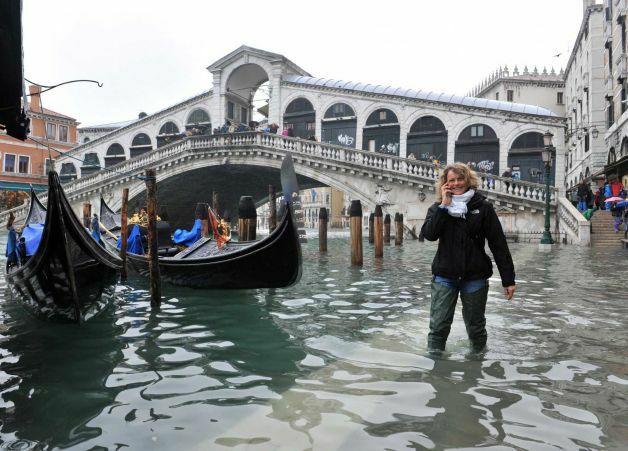 In Venice, visitors expect to see water – but not this much of it. 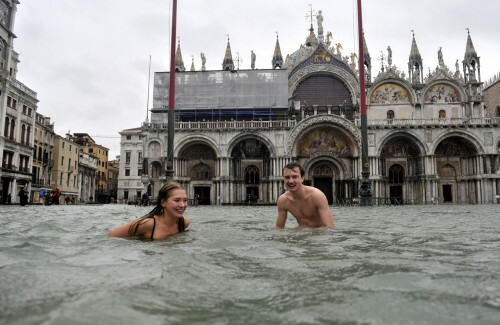 This past week tourists have been wading through waterlogged cafes and swimming across St. Mark’s Square after heavy rainfall caused some of the famous Italian city’s worst floods in years. 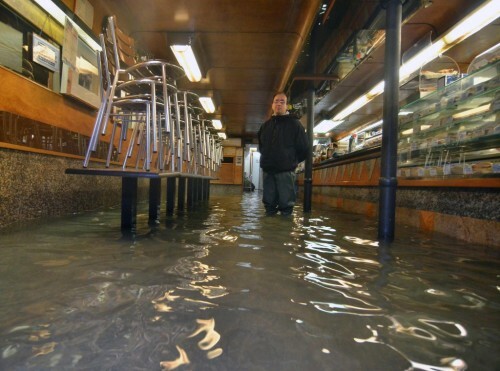 Authorities say 70 percent of Venice was underwater this week. Water levels rose as much as 5ft above average in the past few days, which makes it the city’s sixth-worst flood on record. Can you say "Waterborne disease?" 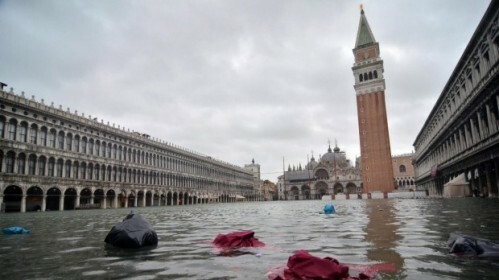 Even before the storm (and to be fair, before Giorgio arrived in Italy), Venetian waters have been higher than normal for more than two weeks now. 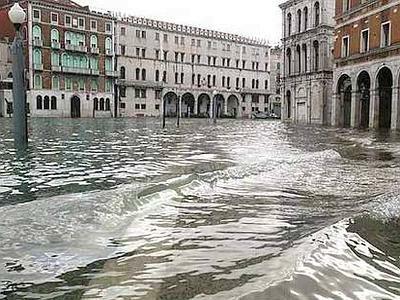 The seasonal “acqua alta,” or high water, periodically occurs when high tides coincide with strong prevailing winds. 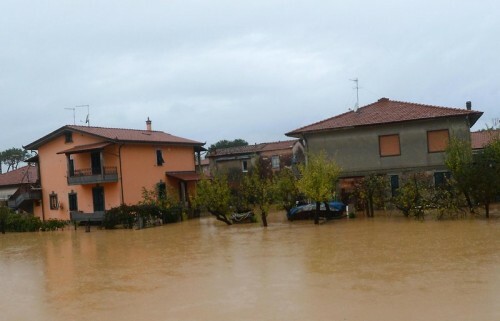 The same bad weather caused floods and mudslides across northern Italy, with some 200 people evacuated from parts of Tuscany, including the neighborhood below Orvieto and in the Maremma region. 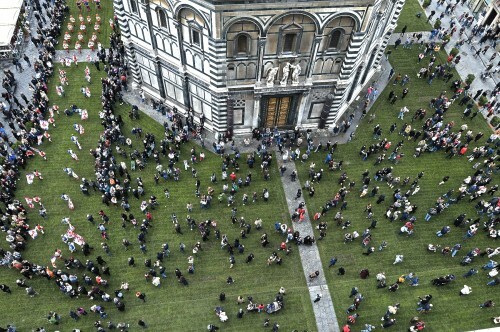 It seems like just yesterday that Florens 2010 brought a lawn to Piazza del Duomo and a full-sized David moved from place to place around Florence. 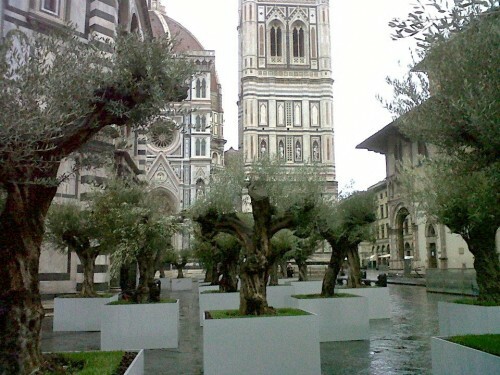 For the second edition of this global cultural event, the city is graced with seventy olive trees forming a grove around the Baptistry and three historic crucifixes inside. Across town, the piazza in front of Santa Croce, as if by magic, has grown a cross of its own, made of tons of marble. The olive grove is best seen early in the morning or late at night when the fewest people are around. The trees are only a small part of Florens 2012. 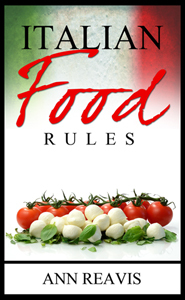 Every day this week there are lectures, bloggers, food and wine, all of which are described on the Florens 2012 website. 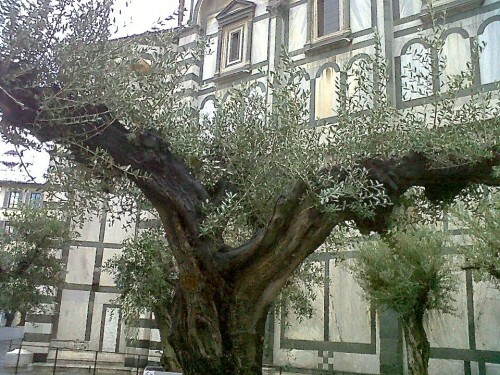 Many of the olive tree are over 100 years old. Those made up of three or four twisted trunks are really branches of a tree that survived the 1985 deep freeze that turned the Arno to ice. Florens 2012 tries to mix the references to the Garden of Gethsemane with environmental concerns of today. Neither symbol comes to mind as you wander through the trees. 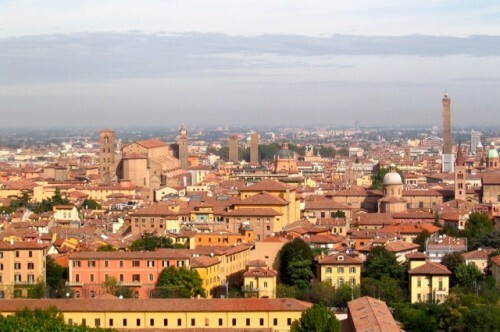 In 2010, the Prato was in honor of Saint Zanobi, but most people just enjoyed the rare feel of grass in this city of stone. These ancient pruned olive trees may only make you think of the drought-caused blight on the 2012 olive harvest and wonder about the high price a liter of extra virgin cold pressed oil will cost in January 2013. As you move inside the Baptistry, the Garden of Gethsemane gives way to the crucifixion with never-before gathering of three wooden sculptures by Florence’s favorite sons – Donatello, Brunelleschi and Michelangelo. 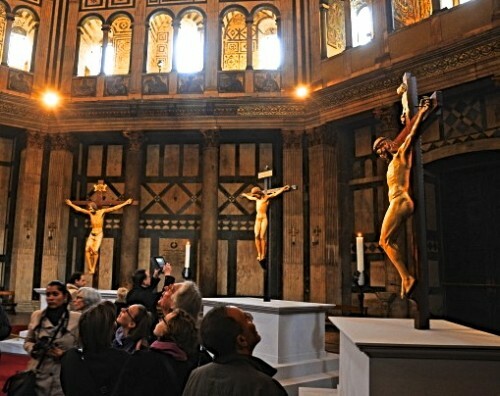 The exposition is know as Mysterium Crucis or Mystery of the Cross. Florens 2012 casts its eyes back 1,700 years (only in Italy can you get away with that) to Emperor Constantine, who in October 312 (they are precise about the month and year) at the Battle of the Milvian Bridge, saw a cross accompanied by the words in hoc signo vinces (in this sign you win). The curators ask you to bring your thoughts forward to the meaning of the cross today. But you may just want to stop and think about the artists who, each in different decades of the 1400s, carved such masterworks out of wood. Each artist had a very different vision and style, but each was influenced by the iconography and customs of their time. Michelangelo’s sculpture is the most shrouded in mystery. 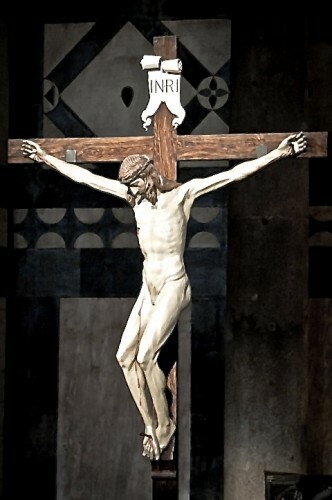 Supposedly carved for the prior of Santo Spirito, this 1492 crucifix, was rediscovered in 1962, but not attributed to the artist until 2001. If art historians have it right, Michelangelo was still a teenager when her carved the crucifix hanging today in the Baptistry. The delicate carving is interesting in comparison to Donatello’s (1413), which was not appreciated by his contemporary, Brunlleschi, who thought the life-like face of Donatello’s Christ looked more like a peasant. 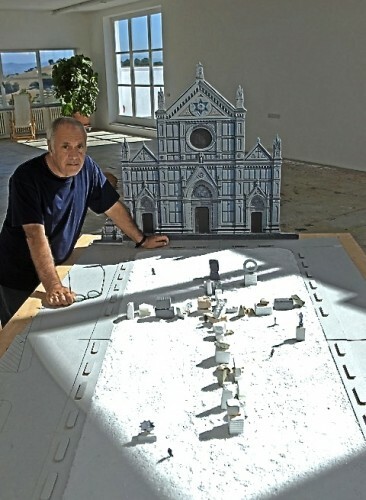 Moving on to the modern, you must walk across town to Piazza Santa Croce where Mimmo Paladino has hauled in tons of marble to create a cross of his own. This is a very interactive piece with people actually encouraged to write on the gorgeous marble’s creamy white face. Art in public spaces is a theme of this piece, although you might wonder how the gold leaf fluttering off one of the blocks is going to last out 24 hours. 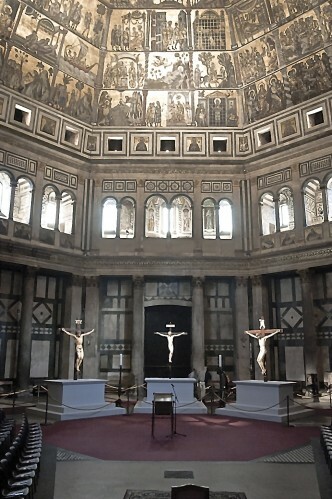 Paladino’s cross includes bronze pieces – body parts, large geometric shapes – as well as monumental carved pieces of stone that are attached to rough-hewn block of marble, seemingly just cut out of the hill-side in Carrara. Part of the public interaction is to scale the heights of these blocks. Only in Italy, it seems. In the U.S. there would be at least warning signs or signed releases-of-liability or, most probably, a high fence. Another aspect of the planned interactiveness involves a a stone cutter who goes around carving out the graffiti left by passers-by. 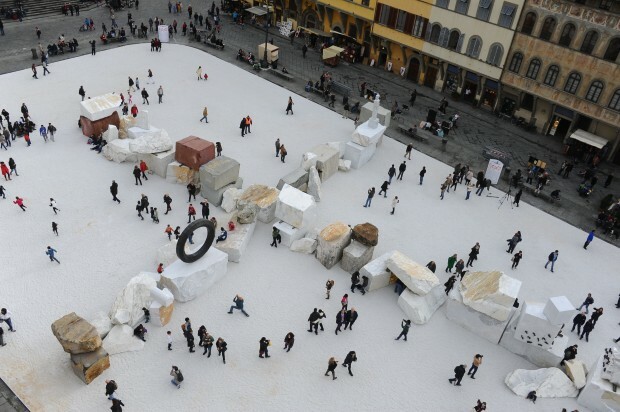 The “I luv Mario” and “Forza Viola!” are now carved into the stone for perpetuity or at least until it is sanded down after the exhibit is removed from the piazza. 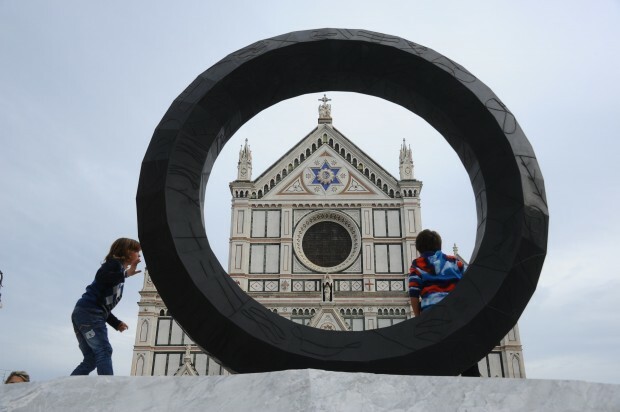 The Santa Croce installation provides the most Kodak moments. It is also the event you will have wished you had seen from the moment the first stone arrived until the last one is removed on November 11, 2012. The Rizzoli Orthopedic Institute is a modern orthopedic hospital, founded in 1896 in the monastic complex of San Michele in Bosco on the hill close to the Bologna center. The Umberto I Central Library, named after King Umberto I, is located in the sixteenth-century rooms where once the books of the Olivetani monks were kept. As with many historic locations in Italy, there is controversy as to the exact date of the construction of the first library of the monastery of Saint Michele in Bosco: to some it was raised towards the end of the 15th century, while others argue that the Priorate of Barnaba Cevenini ordered the construction in 1517. It is certain that in 1677, Taddeo Pepoli, prior of the monastery, refurbished the library, entrusting the task of architecture to Gian Giacomo Monti, and the contract of the ceiling paintings to Domenico Maria Canuti. With Napoleon’s suppression of the monasteries in 1797, the library suffered great damage: the antique 16th century shelves were destroyed and the precious miniature books and manuscripts were dispersed. The former monastery of San Michele in Bosco went through a dark 50-year period until 1841, when the complex became the residential palace of the Legato Pontificio Spinola. In the library, the Canuti paintings were restored. 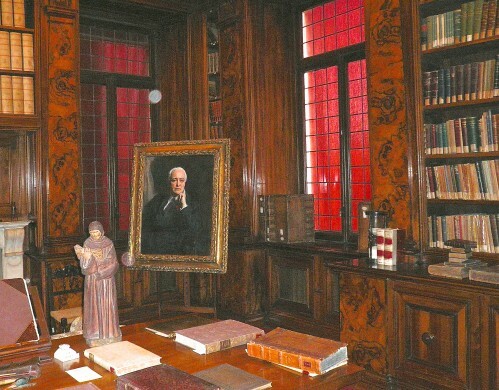 The rooms of the library were used as a hall of princes, cardinals, knights and famous politicians until 1880, when Professor Rizzoli acquired the convent to construct an Orthopedic Hospital. But the library only regained its greatness in 1922, when the director of the Institute, Vittorio Putti, restored the rooms as the Umberto I Library, thanks also to the donations of the Bologna Province to honor the memory of King Umberto I. 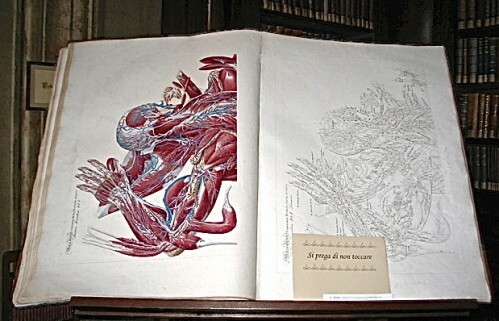 Now the rooms hold one of the most complete and rare collections of books in the entire field of orthopedics. 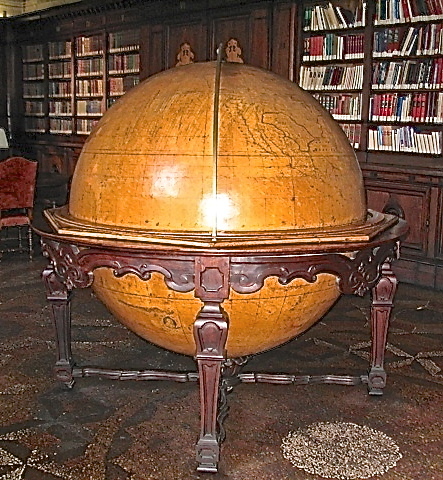 The first item that catches your eye as you enter is a giant world globe. It is the 1762 work of Father Rosini da Lendinara, who used maps and descriptions of global explorers to create the masterwork. 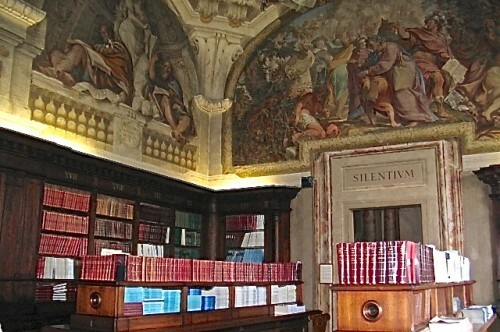 The Canuti paintings shine over the shelves of both ancient and modern books. 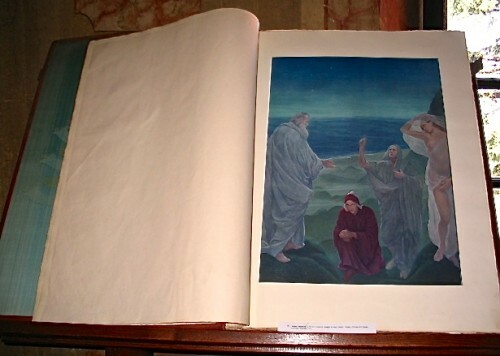 A giant (about 3 feet long and 2 feet wide) complete three volume 19th century copy of the Divine Comedy by Dante is housed on its own wooden shelf. 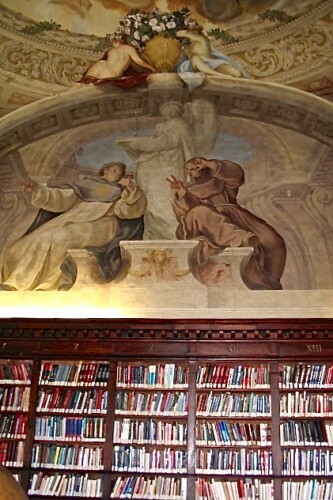 Positioned in what once were the apartments of the Priors of the Monastery of Saint Michele in Bosco, in front of the Umberto I Library, there is the study and private library of Professor Vittorio Putti, which he donated to the institute upon his death. Born in Bologna in 1880, Professor Putti succeeded famed orthopedist Professor Alessandro Codivilla, as director of the Institute. He held the post from 1912 to 1940, the year of his death. An excellent surgeon with great managerial skills, Professor Putti was interested in all issues of orthopedics, introducing new methods and innovative instruments. He gained great international prestige and became an honorary member of the most important foreign societies, as well as being the correspondent for the Journal of Bone and Joint Surgery, the largest medical journal in the orthopedic specialization. A renown book collector, the professor created in his own study/library a small private museum of the history of medicine. 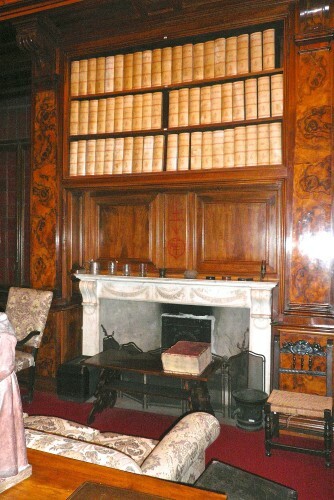 In his study, wall-to-wall with dark briarwood shelves, he gathered more than 1.000 antique books of medicine, including more than two hundred 16th Century works, into a collection, which is considered by experts to be one of the richest and most carefully selected in the world, not only for the quantity, but also for the quality of the texts they contain. 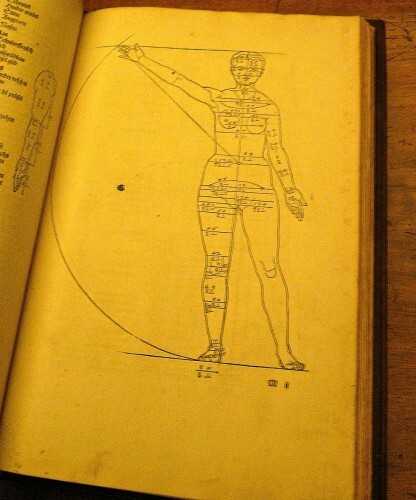 Among the rare collection of texts are editions of Ippocrate, Galeno, Avicenna and other fathers of medicine, you’ll find the Fasciculus Ketham (the first medical book with illustrations published in Italy in 1493); one of the four volumes of anatomical woodcut prints (1528) by Albrecht Dürer (some inspired by Leonardo Da Vinci); the famous first edition of Vesalio (De Humani Corporis Fabrica) 1543; and the first book of orthopedics written by Nicholas Andry published in Paris in 1741. In the Donation Room off of the office hang the portraits of famous doctors, a collection of surgical instruments that were used from Roman times until 1800, as well as other valuable objects bought by Putti from the most famous antique dealers from all over the world, including two splendid manikins from 1500 that can be dismantled and were used in Europe for teaching and in China for diagnosing. Visitors can admire the architecture, the frescos and other works of art from the XVI and XVII centuries in the church and halls of the former monastery by taking City Bus # 30 from the train station to it’s very last stop. Tours of the library are limited by reservation, as are those to the Putti Collection. The Rizzoli Orthopedic Institute is organized in two departments that group wards and healthcare services and research laboratories. The units are specialized in: treatment of degenerative pathologies of the hip and knee; spine pathologies, pathologies of the foot and upper limbs; sports pathologies; tumors of the musculoskeletal system; pediatric orthopedic pathologies; and diagnosis and treatment of rare skeletal diseases. High expertise; organization aimed at integration between research and treatment and the offer of high quality healthcare; innovative technologies in continuous evolution – are the ingredients for Rizzoli’s success in Italy and worldwide. Website: http://www.ior.it/en.